This is the second in a series of guest posts hovering around the question Why Do I Live Here? I ask the question because I’m interested in hearing about the impact NYC has on others. The question has other questions swimming with it, baby questions, like: is there a lot of pressure in their work lives? How do they deal with the lack of space? What are their coping mechanisms? Are there more substances involved, whether legal or illegal, than when they lived elsewhere? Has iPod usage increased to drown out subway screech? Do they jog or yoga to maintain peace of mind, and filter out the Borg-like nature of competing stimuli? Does the city shatter their life’s bones, but enrich their creativity? Or, do they simply thrive on it? 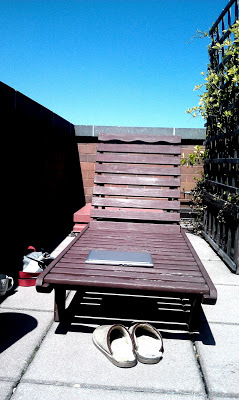 If you are interested in contributing a guest post, please write to newyorkperistalsis at gmail.com for consideration. 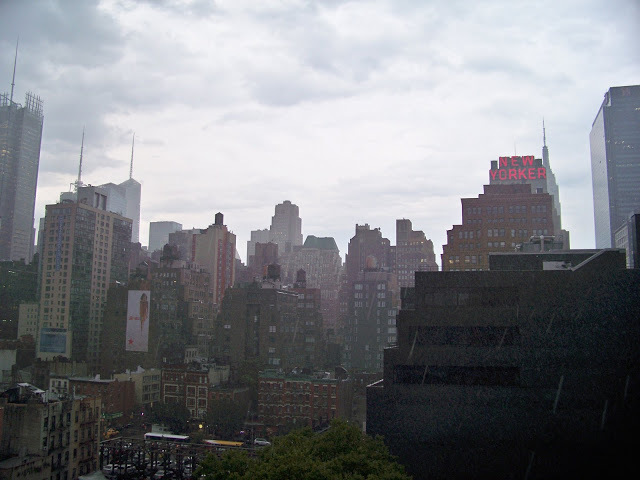 This guest post is by Craig Moreau, who attended NYU for his MFA in poetry. His first collection, Chelsea Boy, was published in 2011 by Chelsea Station Editions. He currently lives in Philadelphia. This post originally appeared on his blog, Chelseaboynyc. We here in the digestive tract hope you like it, and hope that you check out his book. Thanks for contributing to the conversation, Craig, and for being among the first onto the dance floor. I originally intended this to be a short post, just a few pictures, about a not-too unique walk through a Thursday night in NYC. It didn’t take to long for me to realize I was writing my goodbye letter to the city I’ve lived in for the last six years. The day started with a normal shift at Columbia’s Writing Center. I read an essay on ‘the essay’, helped with e-mails for a non-native speaker, and talked with my colleges about the suburbanization of New York (or at least, Manhattan). This is one reason, I’ll say reason #1, that led to my decision to move to Fishtown, Philadelphia. They were proud as they signed the copy I purchased — this was real — they had something tangible that said they were writers, as if in some way adding to their narrative of reintegration. 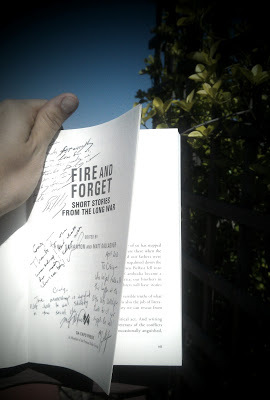 Student to soldier, soldier to veteran, veteran to writer. I thought about my earlier question, if these terms are important for people in constructing one’s identity. In the transitory period from one term to another, perhaps we lose ourselves. Or, is it then that we’re most ourselves? I wrote my honor’s thesis at University of Iowa on veteran’s reintegration. A course that facilitated that thesis, taught by Barbara Eckstein, had a title that always stuck with me. She couldn’t decide if it should be called “Over there and coming home,” or “Coming home, from over there.” The difference is subtle, but one that I’ve never been able to reconcile. After the reading, I joined two friends for a beer at Fiddlesticks, a bar that happens to serve food, located on Greenwich and 7th Ave. We talked about masculinity, Philadelphia, Brooklyn, poetry, music and how people who have more time, talk slower (see: the South, or, Midwest). This led to a conversation exploring why is it, that the time between breakfast and lunch on a beach seems enormous, but when you’re walking through New York it can seem like everything has already passed? Reason #2 why I’m going: New York is too fast. Which isn’t necessarily the main problem, in fact, it was part of the reason that kept me here, but coupled with reason #3, it’s too expensive to notice anything. Teaching, grading, and packing into the (1) Train leaves little time to sail up and down the avenues, filtering from one door to the next, from Chelseas and HKs to Park Slopes and Astorias. After I filtered out of Fiddlesticks, I walked through the Meatpacking and arrived in front of the Soho House. I stopped in for an old standby, by far the best cocktail they make: a Moscow Mule (with extra ginger). I found a spot on the roof with the smokers. I was wearing grey Levis, a blue denim jacket and a beanie–noticeably different from all the heels and fashionably-disheveled ties that swung among the flirtatious laughter. I opened a notebook and began to write. Between my dress, my solitude, and the public writing, I was probably the strangest person on the roof. Some of those who roof’d with me were curious; others were dismissive, but for the most part, everyone ignored what must have looked like a body that could not help theirs. 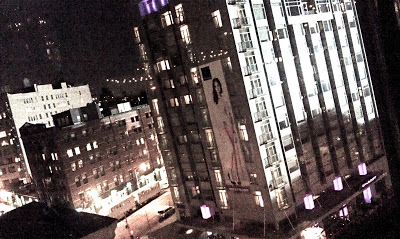 I faced the Gansevoort, the Miami-esque silver steeled and purpled lit hotel. Even though it’s technically below Soho House, everyone here always looks “down” on the Gansevoort. However, not far off the bow-legged Standard observes like a dismissive parent, just far enough away, to laugh at the invented feud. From Mule-side and pool-side, I left for a nearby taco-truck. For $2.50 you can get that authentic corn-tortilla taste that you’ll never have at a Taco Bell. The fresh cilantro carried the ginger from earlier and filtered me into Starbucks on 16th St. and 8th. I sat in the window and drank a green tea with honey, staring directly at the street I called home for a (good) year. I was sitting in a Starbucks, looking across at a Bank of America, and next to that a Duane Reade. It is the most convenient block in Manhattan. There are many convenient blocks in Manhattan. Fishtown, Philadelphia has no Starbucks (Reason #4). It does have a small BoA. Though across the street from it, however, an apartment displays a banner that reads “I hate Bank of America!” The two relieve me a little—it shows some sort of awareness that both perspectives exist. For coffee, I visited the Lola Bean, which safeguards your punch card at the register so you don’t have to hold on to them, the Milkcrate Cafe, which is decorated in vinyls, and The Buzz Cafe, filled with kids, construction workers, junkies, and paintings, which are for sale. The point is there is no Starbucks. Walking home, I almost went to Barracuda (22nd and 8th) but wasn’t quite ready to talk to anyone but myself. So, I came home, made comfort food (mac n’ cheese), added some red pepper flakes to continue the theme punctuated by the ginger and cilantro, and settled into bed. I put on Star Trek (Next Generation), thought about the Prime Directive, and fell asleep. I walked through New York but dreamt of Philadelphia.